Streaming apps are the the trend for anyone wanting to watch movies and TV online at reduced or no cost; if you use them together with generous screens you’ll have a Home Cinema. In this article we’ll discuss the best streaming application for you, by putting Emby vs Plex vs Kodi face to face . With the only that is constant in the world being death and taxes, having an ability to use technology to access and stream the latest movies and television shows quickly and easily is a huge convenience. It has become a popular trend in the market with individuals from all age groups using various streaming technologies. The time when traditional ways of streaming were utilized is long gone. Instead, more advanced and attractive online streaming software like Emby, Plex, and Kodi are available today. However, deciding the best amongst them can get a little tricky. To choose the best option for your requirements, you should consider all the aspects before reaching a decision. In this article, we’ll take a look at each of these media centers and we’ll have those popular Home Theater software compared Emby vs Plex vs Kodi each other, so you can decide what’s the best one. Regardless of your choice of media center, be that Emby, Plex or Kodi, it’s extremely important that you invest in a VPN. VPNs or Virtual Private Networks provide anonymity and security and help ensure that no one is spying on your online activities. This is extremely important when it comes to streaming content as often many of the sources and streams you access use copyrighted content. In these cases if you are not anonymizing your behavior online, you could get into legal trouble. It’s best to choose a VPN solution that is not only accessible on any device you can imagine, but one that is also available around the world. My choice for the best VPN is always IPVanish. They are one of the best companies around and one of the best features with them is their “zero logging” policy. This is really important as it’s not something offered by all companies. We’ve chose Emby as the first on this Emby vs Plex vs Kodi face to face as it’s the newest media center of the three we’re comparing. It focuses on improving the client’s online entertainment experience. It was initially known as “Media Browser,” and it poses as a good choice besides Plex. Its innovative interface makes it easier for users to navigate all their movies, TV shows, and other media files. Emby focuses on streaming on various devices and lives TV streaming. Its server-client setup allows the users to organize their media files and play it from anywhere. What are the benefits of using Emby? Emby attaches metadata and gives the users a facility to access their media files through the web. Hence, it becomes easier to keep the downloaded media in a proper way in a centralized database. Along with its primary purpose of multi-device streaming, Emby also supports streaming the content live from remote locations. You can stream your digital content on any wireless network, although this feature comes only if you’re subscribed to its premium version. Emby supports streaming TV live with the help of a digital OTA antenna, and with a Premiere subscription, you can record live TV screens with a compatible DVR. This online media center has an add-on for Kodi which allows the latter to scrape the entire database of Emby. 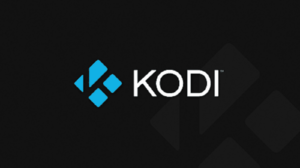 The titles get added directly to your Kodi index. This gives ease to the user as it brings together the performance of both, Kodi and Emby while simplifying your media center. Another plus for Emby is that it allows third-party extensions, which are mentioned as plugins. You can directly install them from the Plugins menu on the dashboard. Emby is compatible with Linux, and Mac OS X. Its apps are available on Android TV, Amazon Fire TV, Apple TV, Chromecast, Roku, and Samsung Smart TV, NVidia SHIELD, Xbox 360, PS4/ PS3, and online HTML playback. You can also install it on Android phones, iOS, and Windows. Also to help you start, we have a special guide for you on How to Install Emby on your Firestick or Fire TV! The original Plex program was created as a substitute for Kodi, which was earlier known as XBMC. Now, Plex has become one of the most accepted and used media centers. It has a very simple look and is easy to install and navigate, and its advanced features are easy to use. Plex is a media center which provides you with a platform to stream your digital media and organize it while sitting anywhere in your home. You can organize, tag, and keep all your digital media, and even set up separate media directories with “Libraries” for your TV shows, movies, music, and photos. It pulls metadata from the computer network. That is, it supplies your media libraries with proper artwork and information to make it easier for you to browse them. Like Emby, Plex also focuses on server-client interaction, where you, the client, can stream and organize your content from anywhere after installing the software. It also supports streaming your content live from non-local networks which don’t ask for any extra setup. Plex has introduced Live TV and DVR to their Plex Pass subscribers, for which you’ll have to pay a periodical charge. This is an exclusive feature for Plex users, but Emby and Kodi provide Live TV for their normal customers too. Another benefit for Plex Pass subscribers is that they can sync selected segments of media to devices like smartphone or tablet and view them offline. Emby provides a similar feature to its clients, but it doesn’t support iOS devices yet. Plex has third-party extensions also, known as Channels which allow you to expand your media selection. They are easy to install, and you can easily stream your favorite movies and TV shows. Here’s a link to some of the best Plex channels for you to experiment with. Plex Media Server is compatible with computers having Mac OS X, Windows, and Linux. You can download its mobile application on various platforms like- Android, iOS, Windows, Xbox 360/ Xbox One, PS 3 and PS 4, Smart TVs, Apple TV, Android TV, Chromecast, Roku, and TiVO. To help you start with Plex we’ve prepared for you a tutorial on How to Install Plex on a Firestick. 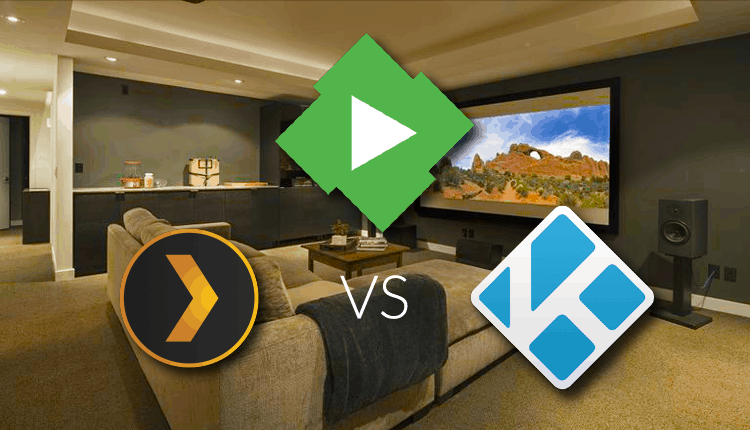 At last but not least, on this Emby vs Plex vs Kodi face to face, Kodi was originally created as a media center for Xbox and was known as XBMC. You cannot stream your content online, but you can arrange and play the content stored on your hard drives, local network attached local (NAS) devices, and USB drives. It has a classy user interface, with a simple yet stylish theme and gives a detailed view of its features and services. You can easily customize this center according to your choice with the help of third-party extensions. By using online “scrapers,” you can organize your media on Kodi. Just like Emby and Plex, it collects metadata to make your browsing easier. It also supports various file formats like Blu-Ray discs, DVDs, .ogg, RealMedia, and VIVO, which is fairly a plus for Kodi users. You also don’t need to convert your media file to different formats as Kodi plays almost every format. Kodi has an OTA antenna and a DVR which allows you to watch and record live TV, while not paying for any subscription. That means these services are completely free, unlike Emby and Plex. While all three, Emby, Plex, and Kodi support third-party extensions, Kodi stands out by delivering a variety of options to the user. Though its addons may be official or community made, installing the late ones can change its whole functionality. Video add-ons give you a chance to watch movies and TV shows on Kodi easily. You can even install the add-ons to integrate Emby and Plex into Kodi, making it a supreme media center. Kodi has specific addons for wrestling and MMA for example as well ones that let you watch the latest Bollywood movies, for example. There are so many addons coming everyday that the difficult is to chose the best Kodi Addons. These addons still need to be written and created for Emby and Plex. Kodi is compatible with a variety of operating systems, like- Windows, Mac OS X, Linux, iOS, Android. You can use it on various hardware platforms like- Raspberry Pi, Odroid, NVidia SHIELD, Amazon Fire TV, Chromecast, and WeTek Play. Kodi is absolutely free for every platform; you don’t have to pay for any subscription or for downloading the apps. Every feature is available on every device and to every user. Here’s a Complete guide for Kodi. This article compared the three main Home Theater Software or streaming applications; Emby vs Plex vs Kodi ones against the others. Emby is surely a new center to try on, only if you’re already using Plex. Although Plex gives more ease and has more options for third-party apps, and is easier than Emby to install and set up. Plex is definitely the most popular media center for some reasons. It is very easy to install and has commendable functionality. It is very good for first-timers, as it very easy to use and comes with extended functions. Kodi is the oldest of these and has maximum customizing options. You can easily transform this media center according to your needs although it requires some skills and patience for installing third-party add-ons and modifying system settings. For choosing your best media software, you need to decide what you’re looking for. Emby and Plex provide many features to their clients for free, while Kodi does it for 100% of its features. That means you don’t have to pay for anything. Personally – right now I’m sticking with Kodi but that is simply because I’m very familiar with it. With Kodi I can always find the right addon that I need so that I can watch what I want. I like what both Emby and Plex are doing though and I’m going to keep an eye on them. Hope we’ve helped you to decide the best Home Theater Software for you, on this Emby vs Plex vs Kodi comparing article. Whatever may be your choice, never forget to use a Good VPN like IPVanish, when using these streaming applications to protect you from hackers, sniffers, and troubles with your country’s law!